India, by far the most ancient culture since the pre-Harrapan period (3500 BC), happens to be the most diverse nation in the world with over 1000 spoken languages and equal or more number of Hindu Gods from which sprout the mythologies, rituals and beliefs which form the backbone of Indian culture. The early Aryans (1700 BC) , Persians (600-500 BC), Greeks (356-100 CE), Parthians (100 BC -395 CE), Sassanians (30-10 BC) and Scythians (100 BC – 400 CE) brought their own culture to the doorstep of India in the north west. The interlude that followed between the invaders and the native dynasties resulted in an epitome of culture brought about by the fusion of the foremost civilized societies of the ancient world. As a result India holds today a bewildering range of ethnicity, culture, color and traditions. The ancient coins of India are a reflection of India’s glorious past and there is no better way than through these coins to realize and relive the splendor that was India. Sixteen kingdoms or oligarchic republics existed in ancient India from the sixth century BC to the fourth century BC. These Pre-Buddhist states in the Mahabharata epic, include Kosala, Kuru, Magadha, Malla, Machcha (Matsya), Panchala, Surasena, Vriji and Vatsa. Each of these Janapadas (Jana; people, pada; foot) reflected the culture of its own people of the region and unique. Janapadas are also mentioned in both Buddhist and Jain texts which confirm their historical reality and continuity. Mahavira, 24th Tirthankar is born (traditional date) into a royal family in the present Bihar region of India. At the age of thirty, he left home in pursuit of spiritual awakening and to spread his philosophy which is now followed by over four million people in India. Cyrus, Gold Coin ca 550 BC. Cyrus, son of Cambyses I, founds the Persian Achaemenid Empire, and conquers the borderline North Western regions of the Indian subcontinent to establish one of the greatest empires of the ancient world. In 516 BC, the Persian king Darius of the Achaemenid tribe embarked on a campaign to Central Asia, Aria and Bactria by marching from Afghanistan to Taxila (present Pakistan) before capturing Gandhara and other regions surrounding the Indus River. Siddhārtha Gautama, the Buddha-to-be, born in Lumbini into a royal family in the republic of the Shakyas, which is now part of Nepal. Alexander defeated Darius III and invaded India in 326 BC, but was eventually forced to turn back at the demand of his troops facing the prospects continued war with King Porus who ruled parts of present Punjab. Following the death of Alexander the Great in 323 BC, his Greek general Seleucus I Nicator (c. 358 BC – 281 BC) carried an expedition to India, where, after two years of war (305-303 BC) with the Indian Emperor Chandragupta Maurya, made peace with him. Nanda dynasty originated in the region of Magadha and lasted during 345–321 BC. Their empire extended from Bengal in the east to Punjab region in the west, as far south as the Vindhya Range. Chandragupta Maurya conquered the Nanda Empire and founded the Maurya Empire. Samudragupta, the son of Chandragupta I succeeded after his father’s death and conquered almost the whole of India except the south. His vast military campaign added the neighbouring kingdoms of Ahichchhatra (Rohilkhand) and Padmavati (in Central India), whole of present Bengal, Afghanistan and Kashmir to his empire. Bindusara, the son of Chandragupta inherited the vast regions of northern, central and eastern parts of India along with parts of present Afghanistan and Balochistan at the age of 22 years. Greeks knew him as Amitrochates, the destroyer of foes). Bindusara later conquered almost all the Indian peninsula, except the Dravidian South. Asoka, son of Bindusara 268- 232 BC reigned over the entire Indian subcontinent except the present-day Tamil Nadu and Kerala. The misery following his war against the Kalinga state led him to embrace Buddhism. After his death, the Mauryan dynasty lasted just fifty more years. 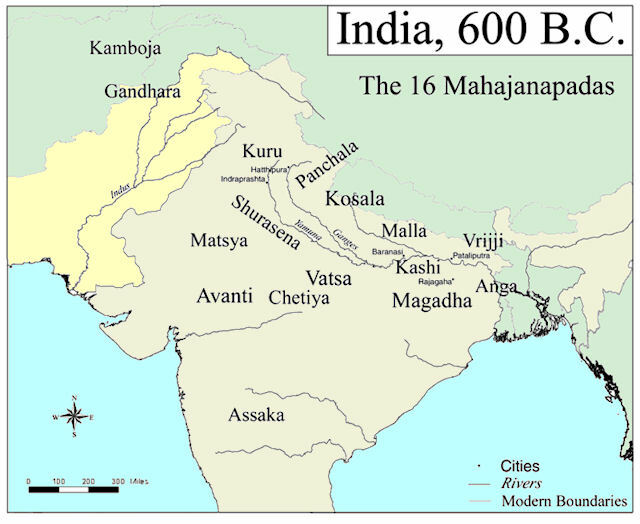 The Shunga Empire, an ancient Indian dynasty from Magadha that controlled vast areas of the Indian subcontinent was established by Pushyamitra Shunga following the fall of the Maurya Empire. The Indo-Greek kingdom was founded by Demetrius I who invaded the Indian subcontinent in the 2nd century BC. The kingdom had more than 30 Indo-Greek kings. Of them the most famous was Menander (Milinda) who ruled from his capital at Sakala in the Punjab (present-day Sialkot, Punjab, Pakistan). The Indo-Greeks ultimately disappeared as a political entity around 100 AD following the invasions of the Indo-Scythians. Scythians (Sakas), a large group of Iranian Eurasian nomads migrated to central and northern South Asia including Gandhara, Sindh, Kashmir, Punjab, Haryana, Rajasthan, Uttar Pradesh and Bihar in 100BC. The first Saka king in south Asia was Maues established Saka power in Gandhara (modern day Pakistan and Afghanistan region) extended supremacy over north-western India. Indo-Scythian rule in North Western India ended following the defeat of the last Saka Satrap Rudrasimha III by Chandragupta II, the son of Samudragupta, in 395 CE. During the latter’s rule the Gupta Empire reached its peak in art, architecture, and sculpture and came to be known as the “Golden Age” of India. Kumaragupta I succeeded Chandragupta II as emperor and kept the empire intact by defeating the invaders Pushyamitras from the banks of Naramada River and the White Huns, a Nomadic tribe from Central Asia. Kumaragupta was succeeded by his son Skandagupta after whom seven Gupta emperors ruled until the middle of 6th century when the greatest empire of ancient India disintegrated into petty chiefdoms. Ancient Indo-Parthian Kingdom that occupied the present regions of Afghanistan and Pakistan was founded by Gondophares I or Phraotes of Central Asian Iranian Tribe in ca 30 BC . The city of Taxila is thought to have been the capital of the Indo-Parthians as per excavations by Sir John Marshall in 1913. Vima Kadphises (c. 95 – c. 127) the grandson of Kadphises was Kushan emperor from ca 90–100 CE and his successor and son Kanishka I (c. 127 – c. 140) the Great ruled virtually all of northern India from his two capitals Purushapura (Peshawar) and Mathura. Vasudeva I (c. 190 – c. 230) was Kushan emperor from about 20 years after the death of Kanishka. He was the last of the “Great Kushans whose rule coincided with the invasion of the Sasanians in the present Afghanistan, Pakistan and northwestern India from around 240 AD. The Hephthalites or White Huns, were a confederation of nomadic and settled people from Central Asia who expanded their domain westward in the 5th century. They invaded North-West India in ca 450 CE, posing a threat to late Gupta Empire. Although they were repelled, they served to destabilise the Guptas. At the height of its power in the first half of the 6th century, the Hephthalite Empire controlled territory in present-day Afghanistan, Turkmenistan, Uzbekistan, Tajikistan, Kyrgyzstan, Kazakhstan, present Pakistan and other regions of north-west India. Prabhakarvardhana the 4th emperor of Vardhana dynasty defeats the Huna invaders, and his son and successor Harsha (c. 590–647), also known as Harshavardhana rules North India from 606 to 647 from his capital Kanauj. The Empire of Harsha at the height of his power spanned the Punjab, Rajasthan, Gujarat, Bengal, Odisha and the entire Indo-Gangetic plain north of the Narmada River. Harsha was defeated by the south Indian Emperor Pulakeshin II of the Chalukya dynasty when he invaded the southern peninsula of India. ‘Imād ad-Dīn Muḥammad ibn Qāsim ath-Thaqafī ( 695 – 715 CE) was an Umayyad general who conquered the Sindh and Multan regions along the Indus River (now a part of Pakistan) for the Umayyad Caliphate. He was born and raised in the city of Taif (in the present Saudi Arabia). Qasim’s conquest of Sindh and southern-most parts of Multan enabled Islamic expansion into India. Rashtrakuta (753-982 CE) was a royal dynasty ruling large parts of the Indian Subcontinent between the sixth and 10th centuries. Having defeated King Kirtivarman of Chalukiya Dynasty (543-753) they rose to power with Karnataka as their power base in South India ca 753. Their contemporary rulers were the Pala dynasty of Bengal (ca 800-1200) and the Prathihara dynasty of Malwa (700 – 1036) in eastern and north-western India respectively.